CuCo were tasked by our Bournemouth Seafront client, The Prom Café, to brand their all-new ‘PierView’ venue. 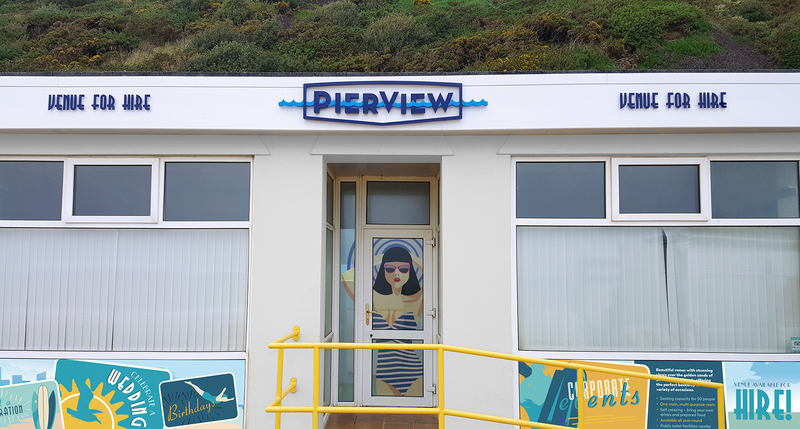 The PierView is a new private hire venue, set in the spectacular seafront promenade right next to Boscombe Pier. The venue boasts stunning views over the golden sands of Boscombe beach, offering the perfect backdrop for a variety of extra-special occasions. Our Design Team began the creative process by visiting the venue, and luckily the sun was shining so it was ice cream time whilst embracing the location and all its beauty for our creative inspiration. Once back in the studio the brainstorming began, observing our photos of the location and analysing all that was on offer. Our creatives all agreed a retro beach theme would be perfect for such a hotspot, with inspiration taken in the form of vintage postcards and posters that focused on the area. A series of flat graphics were designed and then supported by fitting retro-styled typography. Before the project could progress onto brand rollout, it was vital to establish an identity that would fit the new brand creative, whilst having the impact to stand out in such a busy location. CuCo are never content with the boring. We believe in strong, original creative ideas in all we do and this project was no different. From inside the venue the first thing you take in is the sea, you are so close to it, therefore it was decided to explore how we could incorporate this into a new logo design. After scamping out various approach’s finally the perfect solution was found that incorporated that little clever spark, as we used the ocean waves to break through the centre of ‘PierView’ and to take the place of the middle lines within the capital E’s. However, lets not forget the name! ‘PierView’ meant there had to be a connection with Boscombe Pier, and therefore as the V sits central to the name our designers embraced the link between this and the roof lining of the pier which is V shaped. With our clever brand identity in place the next phase was to apply our new creative across various materials, including signage, window displays, promotional literature and advertising. Since the implementation of our new branding, ‘PierView’ has seen a noticeable increase in customers in the venue, as well as a higher private booking rate. The client was extremely impressed with CuCo’s creativity and innovation throughout the project, and have felt that the advertising materials have excelled expectations by incorporating the unique characteristic features that surround the venue into the branding itself. The new marketing materials have also driven new media enquiries and attention into the surrounding area along with the venue, improving business and tourism alike. Are you looking for a fresh brand identity for your venue? Get in touch with CuCo today on 01202 911959 or email us at hello@cucocreative.co.uk – We’d love to help!